about 1,850 litres for every resident of the tiny village. 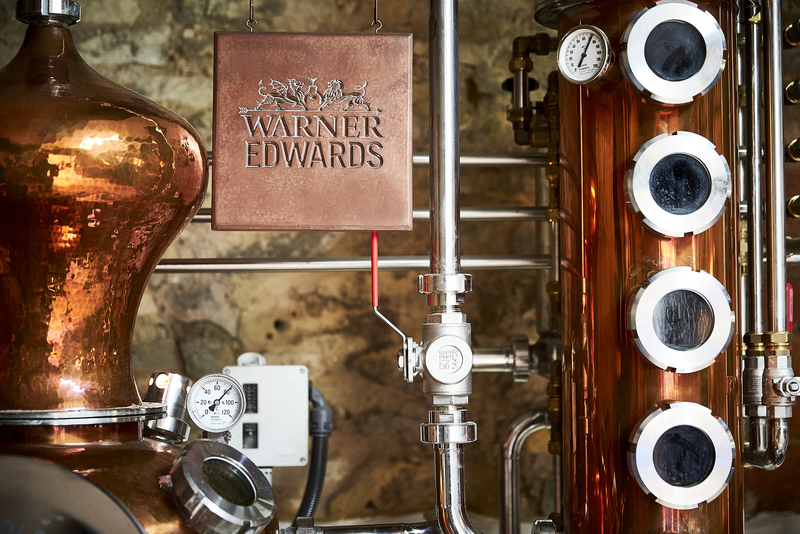 Naturally, the flavour of every Warner Edwards spirit begins in the distillery itself and with the making of their Harrington Dry Gin, which forms the base for several of the distillery’s flavoured variations including the Elderflower, Sloe and Rhubarb. It all began with a small two-litre still and some vodka. ‘We bought just herbs and spices from the supermarket, used them with vodka and created some flavours, they were all terrible, none of them were good,’ Tom laughed. ‘It was about tuning into that sort of science of it.’ But the breakthrough came from a family friend named Heather who introduced Tom to a series of single-botanical distillates. ‘I had no idea what a distillate was,’ he said, but she had a kit of 50 different distillates. ‘We would sit around the kitchen table every Saturday over the summer of 2012… we would add 1ml of this flavour, 2mls of that flavour, mix it with neutral grain spirit, let it sit for a week.’ Over four and a half months of experimentation, ‘we came up with the theory of our dry gin.’ Tom insists on keeping one of their botanicals secret, ‘it’s nothing outlandish!’ he laughs, but the rest of the ingredients in their Harrington Dry Gin are as follows: juniper, coriander seed, angelica root, cinnamon bark, orange peel, black pepper, lemon peel, cardamom, elderflower and nutmeg. the still features a 4.3-metre rectifying column, a dephlegmator, and catalyser. The latter of which Tom describes as being the primary reason why they went with a Holstein. In short, the catalyser is a honeycomb-like copper plate which increases copper surface area thus reducing the presence of unwanted compounds in the final distillate. Or more simply, the final spirit will just taste better. Family has been a big part of Warner Edwards, from the Warner family farm where it sources its spring water, to the creative influences of family. ‘My mum came into the kitchen with a bottle of Gordon’s that she put fresh Elderflower into, we tried it and it was lovely,’ shared Tom as to the origins of their Harrington Elderflower Gin. ‘We’re not Diageo or Pernod Ricard with expensive insight teams, we just do what feels right,’ and this taste of his mum’s homemade infusion inspired its first flavoured gin. It begins using the standard Harrington Dry Gin as the base, and the aforementioned 217 hand-picked elderflowers (on average) are infused via post-distillation maceration. The colour and flavour is all natural. ‘We launched the elderflower gin in the summer of 2013. We made 2,000 bottles and we thought it would last a year. It sold out in eight weeks.’ Tom’s mum’s love of gardening further inspired the team to convert her backyard herb garden into a Botanical Garden on site for ‘flavour development and inspiration’, and has since become what Tom called a ‘hotbed of creativity’. Melissa Gin was the first in a series of limited edition gins that prominently feature these home-grown herbs. Melissa officinalis, aka Lemon Balm, is leafy, herbaceous, and closely related to mint. Warner Edwards combines the Melissa, with fennel stems and juniper – the Melissa Gin is its own distillation and unlike other gins in the Warner Edwards line does not use Harrington Dry Gin as its base. The end result is lightly citrusy on the nose with fresh herbaceous, mintiness on the palate; Melissa Gin truly honours lemon balm as a botanical and celebrates the memory of Tom’s mother and her love for gardening. ‘Guys, I want to sell you an ingredient, I want to be involved.’ Tom told the story of a gentleman who badly wanted to get involved with the distillery. ‘I’ve got sloes! I’ve got cherries!’ And then at the end – as if almost an afterthought – he mentioned he had a small batch of rhubarb which used to be Queen Victoria’s. The story goes that Queen Victoria loved rhubarb so much that during a period of tense trade relations between the UK and their top source for rhubarb imports, China, that in order to sate her desire for the crimson-stalked vegetable, she had to secure a local source. Thus, rhubarb gardens were planted across the kingdom. Through a series of what Tom described as ‘tenuous’ connections, they were able to trace this rhubarb source back to a cutting made from one of Queen Victoria’s original gardens. Warner Edwards made this rhubarb the foundation for its next gin. It was the third time that was the charm, and Warner Edwards’ dedication to colour paid off. ‘After we saw some rhubarb thawing in the sun before you cook it, we saw pink juice bleed from this fresh rhubarb, we put it through the cider press, and got a bright pink colour which was way better. We get this rhubarb juice that is fresh, uncooked, very acidic – it’s brighter and fresher on the palate. We use [the juice] to cut the gin.’ It then adds a touch of sugar to balance the acidity. The colour in the bottle immediately calls to mind fresh rhubarb and looks decidedly different from any other gin on the shelf. Warner Edwards’ rhubarb gin has been hugely influential; a December 2017 piece in The Telegraph suggested that its gin might have inspired what grocers and journalists are calling a ‘rhubarb revival’ in the UK. One of the highlights of the year for the nearby communities must be Warner Edwards’s annual Sloe Swap (or at least to gin geeks like myself). For the unfamiliar it goes like this: you bring the sloes and you can swap them on the spot for Harrington Sloe Gin. Tom described it as ‘a way to get the community involved’, adding with excitement, ‘this year we got nearly a ton in one day’. It’s certainly a fast way to get a lot of sloes, and when you use ‘half a kilo’ per bottle, it certainly does take a village. Warner Edwards’ second release, the Botanical Garden series, is helping to make the British countryside a little more beautiful. Every bottle comes with a packet of bee-friendly flower seeds to plant your own wildflower meadow. ‘It’s not a honey gin, it’s Honeybee Gin,’ Tom said proudly. ‘It’s the biggest, wildest ingredients we’ve put in any gin, but with a focus on what the bees like.’ Among its 28 botanicals, it includes bee-friendly wildflowers like blue cornflower, hibiscus, chamomile and rose, while rounding out the flavour with lots of citrus, sage, cubeb berries, grains of paradise, juniper and coriander. The final cut is done with a bit of fresh honey from Warner Edwards’ own on-site beehives. With each bottle sold, support is given to the Royal Horticultural Society to help fund their sustainability and environmental work across the UK. It’s the rare gin that has two ways to make you feel good. What’s more fun than that?